My wonderful new fountain pen ink ---Pilot 'Iroshizuku' "yama-budo" (which translates as "crimson glory vine")---- and my lovely ivory Jinhao X450 fountain pen. 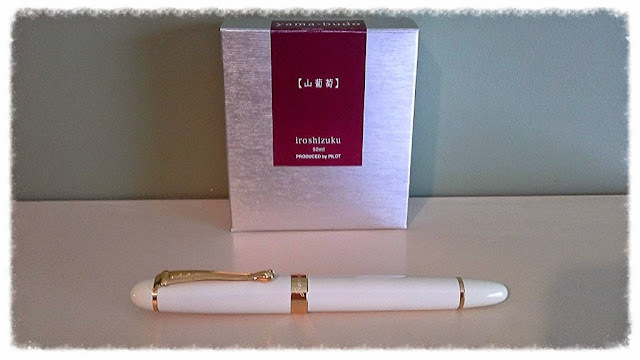 The ink was recently purchased at Nikaido in Richmond, and the Jinhao from Tyler Dahl of Tyler Dahl Pens a while back. Tyler modified its nib to a really nice 0.7mm stub, and it has become one of my favourite writers. Many thanks to Sara & Joe at Nikaido, and Tyler for the excellent customer service!